Architectural Digest Frenchis a magazine of unmatchable quality and standard of production. 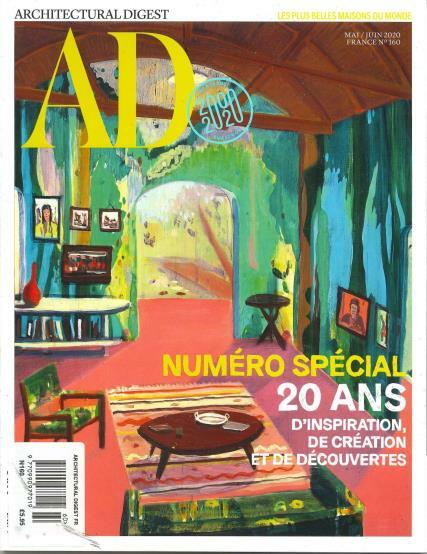 Buy a single copy or subscription to Architectural Digest French magazine. It concentrates on the passion of architecture, and it is published in French. The magazine extensively focuses on the changing concepts of interior decoration and architecture along changing times. Different parts of the world engage in different ideas and styles of architecture. The magazine brings together all the concepts and presents to you with the best and most compact version of architecture. This magazine is adored by professionals and enthusiasts alike, coming together with a common platform of interests. Ever since its first publication, this magazine has been highly appreciated by the readers and they have been instrumental in providing immense success to the publication. Every issue of the magazine brings you 250 odd pages of informative content that keep you updated throughout the year. Architectural Digest features the work of several architectural designers, along with some great illustrations to inspire you to let your passion in architecture grow and take it ahead. The magazine beautifully blends the ideas of the age-old traditional architectural designs and the more modernized creative concepts of today.